After the success at Bournemouth University’s BUnique event the new Advertising Society (ADSOC) is successfully up and running with many exciting and interesting goals for the year. One of the most exciting briefs the ADSOC is expecting to tackle this year is set by successful Dragons’ Den entrepreneurs ‘Love Da Pop Corn’. Co-founder and ex-BU student, Christian Hartmann, has set ADSOC members the task of helping to expand their business over the Dorset area. Other goals include helping the different BU clubs and societies to advertise themselves and their events. The Alternative Performance Society was the first to have their Christmas showcase advertised by ADSOC. Inspiration comes from all members of the Society as all students are welcome. he members of the new society have already planned their first social trip to the Brand Museum in London on the 25th of January. This fun and educational excursion will help give students some perspective on how important branding has been and still is. if you’re interested in being a part of ADSOC or if you’d like their help with advertising, visit the ADSOC website or pop along to one of the socials (dates and information on the website). This year’s Student Union Part-Time Officers Elections were the biggest in the history of Bournemouth University. Nearly 40 students ran for election and a record number of students voted. The Part-Time Officers are active in supporting the Full-Time Officers (President, Vice President: Communications, Vice President: Education and Vice President: Landsdowne) across the full range of student affairs. Their roles include everything from Community Officer and Environmental Officer to Democracy Officer. PR, Advertising and Marketing students were not to be left out of the campaigning fun! Several from the CMC school were nominated for various positions and got going with persuading the 18,000-strong population of Bournemouth University that they were the best for the job. First year PR student Dev Mistry has been successful in becoming our Community Officer. This means he takes the responsibility of helping integrate Bournemouth University with the local area and vice versa. Local residents and students hopefully live side by side in harmony and the Community Officer’s job is to actively promote and encourage students and the community to share their skills and expertise. Dev says: “As a first year it was quite daunting to run for the post. I was up against some really well known people and their manifestos were amazing.” This is a sentiment echoed across the vast number of nominees. Emmy Smith, a second year Advertising student agrees that a real bond was formed between the people running and that many have made firm friends with their competition. Dev’s campaign focused on the use of social media, namely Facebook and Twitter. Telling people his plans for the coming year over these platforms helped voters to spread the word easily if they liked what he had to say. It was the best way for him to reach a vast number of students on a personal level. Many of this year’s winners used the same approach, adding to notion that social media really is the way to get movements off the ground. Final year Advertising student Samantha Stockwell was also successful in her bid to become Campaigns Officer. In addition to using social media, Stockwell employed a creative campaign. She took to the university floors with small paper hearts, with “Love Sam” hand written on each of them. Perhaps an indication that – while social media is fast acting and mass appealing – at the end of the day, we love a free treat. Well done to all the nominees and congratulations to Dev Mistry and Samantha Stockwell! Posted January 9, 2012 . Filed under CMC News. In 2003 Matt McKenna and Sarah Townsend, both alumni of Bournemouth University’s Public Relations degree, made the brave move of establishing their own PR agency. Having worked together for 5 years, they knew they had the right blend of skills, knowledge, experience and drive to make McKenna Townsend PR a success. And they were right- McKenna Townsend is now the leading PR consultancy in Dorset and Hampshire, with big name clients such as Waitrose, B&Q and Subway, alongside local clients such as Dorset Police. Jabir Siraz-Ullah is the the winner of this years Bournemouth University placement student prize, having performed outstandingly on his placement with Eli Lilly & Company. Spending a year at Eli Lilly & Company, one of the world’s largest pharmaceutical company’s’, Jabir immensely impressed his employees, by creating a positive opinion of himself and his work with all levels of staff. Jabir consistently exceeded expectations in terms of quality of his work, and his can do attitude resonated well with his employees. Jabir credited his placement with giving him the ability to utilise the academic theory learnt in his BA Hons Marketing course, and felt it allowed him to grow personally and professionally, thanking Phil, Tunde and Nishta at Lilly for his development. We are delighted to welcome Ana Adi and Shelley Thompson to the CMC Academic Group as Lectures in Corporate and Marketing Communications. Ana will focus her teaching and research on digital communication strategies. She is also a doctoral researcher in the Faculty of Business and Creative Industries at the University of the West of Scotland where she investigated the framing of the Beijing 2008 Olympic Games as done by public relations practitioners, online non-accredited media outlets and online readers. Prior to her doctorate, Ana completed a Fulbright scholarship at the University of Missouri-Columbia, USA. Ana has also worked as an independent Public Relations Consultant specialising in new media and online communication strategies. She is a member of the Board of Advisors of SMGECP (Social Media Global Education Connection Project), actively promoting for a more extensive use of new and social media both in research and the teaching process. She is the recipient of EuroBlog Social Media Awards for the most innovative use of social media techniques in a communications research project or investigation. A former Journalist, Shelley is completing her PhD in the Media School under the supervision of Professor Stuart Allan, conducting a longitudinal framing analysis newspaper reporting on nanotechnology. During this time, Shelley has been an enthusiastic and popular part-time member of the CMC teaching team, delivering lectures and seminars on Communication & Research Skills, Persuasion & Influence and Public Opinion and Persuasion. Shelley has been heavily involved in the Media, Communications & Cultural Studies Association Postgraduate Network (the past two years as Chair) and was instrumental in organising their 2011 conference at BU in July. Alongside all this, Shelley and her husband Brian have recently become the proud parents of a baby girl, Penney. We look forward to working with Ana and Shelley. Second-year BA Marketing student Anna Ward has won a franchise business in a competition for young entrepreneurs. She will take on branch of accounting firm Equation following her studies after winning an Apprentice-style challenge. The £20,000 prize includes equipment and software to run a new business, branded stationery, business cards and PR materials, a PR launch campaign and a dedicated support team to help Anna establish the business. The competition was set up by Stephanie Pettitt, who runs accounting firm Equation, to promote young people in business, and was hosted by BU in November 2011 in the Executive Business Centre. The challenge invited six students to pitch their business ideas to six entrepreneurs. Anna impressed the judges after putting forward a strong business and growth development plan. Anna’s hard work and preparation really paid off. “I had to write a 2000 word franchise growth plan and marketing strategy”, she said. “This included where I wanted to be in a few years time and what I wanted to achieve from the franchise. I also had to tell Equation a bit about myself, how winning would change my life, why I should win and my other achievements – very much like placement application questions! About a week later I got a phone call saying that I had made the final six and that I would need to pitch my ideas to the judges, who were all top business people from the Dorset area, as well as an audience. I put together a PowerPoint presentation and spent days rehearsing my growth plan and marketing strategy. Although I was nervous, I viewed it as a good experience and knew I would come home the evening after my pitch feeling like I had learnt something and gained some experience for interviews and presentations in the future. “It was a real ‘apprentice’ experience! The candidates all sat in a room on the side discussing how worried we were and it was nice that there was no competitive feel in the room. I volunteered to pitch first and, as I began my presentation, my heart was beating very fast! However, after the first few minutes I started to really enjoy myself and get into what I was talking about and hopefully showed my enthusiasm for the business. The judges threw a range of questions at me about my projected turnover, my targets and my ‘plan b’ strategies if all else failed. I left the room feeling really happy and relieved that it had all gone smoothly. In October, CMC held its first Careers Fair in the University’s impressive new Kimmeridge House, to demonstrate our commitment to employability and to help put our CMC students in touch with employers looking for graduate and placement staff. The employers were hugely impressed with the quality of our PR, advertising, marketing and communications students, nearly 350 of whom attended. Most of the stalls were manned by either CMC placement students or CMC graduates, as they were perfectly placed to give key advice. They said that they were keen, smart and they noted how well turned out and professional they were. Student feedback was very positive too, so much so that they asked for a bigger one in the New Year. So we have booked a bigger hall for the afternoon of Wednesday February 15th. This time, not only will employers be able to have a stand in the much larger KG01, but there will also be the opportunity for them to give a presentation if they wish. There’s still time for employers to book a space at the February Careers Day. Contact organisers Elsbeth Caswell (ejcaswell@bournemouth.ac.uk) or Sue Latham (slatham@abournemouth.ac.uk) for a booking form and further information. The Ede & Ravenscroft best first year student prize has been awarded to Lucy Millett on our BA (Hons) Marketing programme. Lucy had an outstanding first year. She gained an overall stage mark of 72% and, right from the outset, was highly engaged in her learning, contributing intelligently in seminars. She has been a consistently good attendee, preparing well for lectures and seminars, and engaging well with the course. Several of her assignments will be used as examples of exceptionally good pieces of work for next year’s students, as they were mature and critically accomplished pieces of work demonstrating good scholarship. As one of our Peer Assisted Learning leaders this year, she will be a first class role model for other students, and the Programme Team wholeheartedly supported her nomination for this prize. The prize was presented to Lucy by the Vice Chancellor, Professor John Vinney in the Atrium in Poole House last month. Her Programme Leader (Colin Merrett) and Level Tutor (Dr Yue Meng) were also present. Posted January 6, 2012 . Filed under CMC News. Dr Sukhpreet Singh, Lecturer in Marketing, in the Media School has co-authored (with Olswang, London-based leading media and telecommunications law firm) the Frapa Report 2011 Excerpt Stamped. 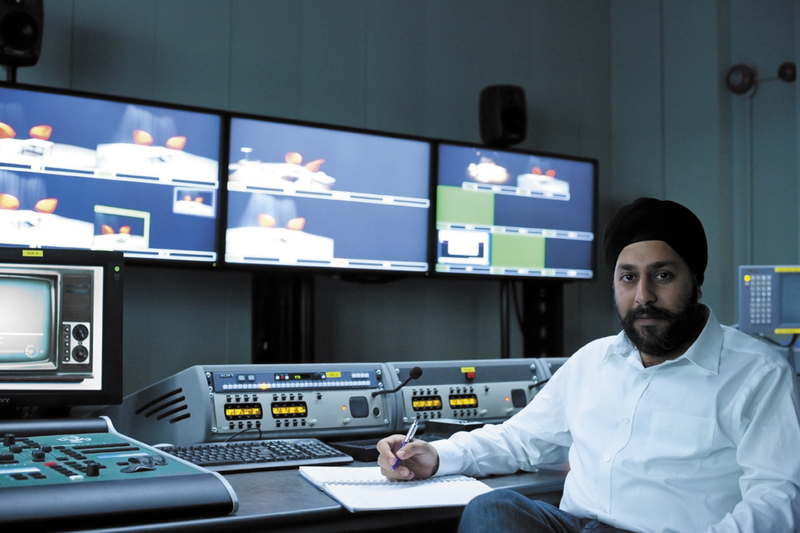 Commissioned by the Format Recognition and Protection Association and supported by the Government of North Rhine-Westphalia, the report outlines ways of tackling format imitation and protecting your television formats in 14 key television territories including Australia, Belgium, Brazil, Canada, India, the UK and the USA. The authors have provided an easy to read, yet comprehensive and authoritative, guide to the legal as well as market-based options available to format creators should their formats become the subject of a rights dispute. Launched on 4th October 2011 at a MIPCOM press conference in Cannes hosted by David Lyle, CEO of National Geographic Channels, and FRAPA chairman, Ute Biernat, CEO of GRUNDY Light Entertainment, the report examined over 40 reported judgments from around the world, covering copyright, unfair competition, breach of confidence and trade mark law. In many of these cases, format creators successfully enforced their rights by relying on a suite of different laws that protected their formats as valuable intellectual assets. Central to the report is a case study of the world famous TV format ‘Who Wants to be a Millionaire’ which exemplifies market based strategies that can be utilized, as an alternative to legal protection, to exploit formats internationally.